Note - No Shuttles On Friday! We encourage you to use public transit. We will have some parking options as well as a shuttle on Saturday to help get you from here to there. Please note - the Pirates play at home this weekend. Friday, July 13th at 7 pm and a doubleheader on Saturday, July 14th starting at 12:35pm. There will be traffic around the stadium area an hour before each game, so you may want to avoid that area at those times. 1) James Street Garage connected to Allegheny General Hospital. This garage holds 817 cars. 2) Howard Street and E. North Avenue - There are a number of spaces up Howard Street. This parallels 279 and intersects with E. North Ave.
3) Nova Place Garage (Formerly Allegheny Center Garage). This is the old Allegheny Center. Now named Nova Place. 2,500 spaces. Park there before 5pm and beat the folks going to the Pirates game. 4) Strip District Alco parking lots. Park right below the 16th St. Bridge and walk across. It’s a 5 minute walk. Our first venue is on the other end of the bridge and that is also a shuttle stop. 5) Parking lot on the Northside end of the 16th St. Bridge. This lot probably holds 100 cars and turns a blind eye to parking there on the weekends. This is a very short walk to all events and right next to a shuttle stop. 6) West General Robinson St. Garage - T Station - take the free Music Fest shuttle from this location. Pickup is right on W. General Robinson Drive. Open from 3pm to 1am. 7) Numerous street parking options where you can find them. The folks at Bike Pittsburgh are going to be providing us with some bike racks. Look for these on Foreland Street, Wigle Whiskey and Penn Brewery. 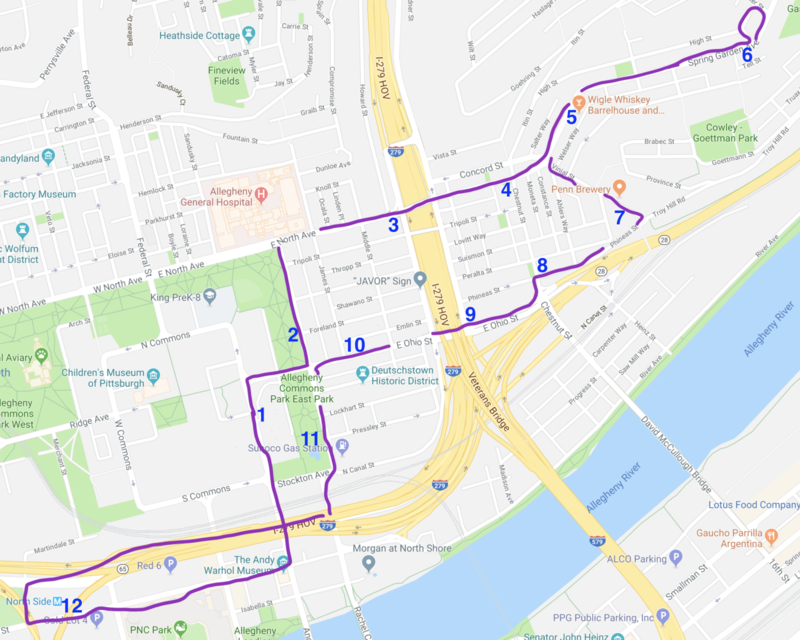 Two free shuttle bus will be traversing the Northside. The first shuttle begins at 11 am and goes to 7:30 pm. The second shuttle begins at 4 pm and goes to 12 midnight. - Directly outside of escalators and across the street. Shuttle continues past PNC Park.